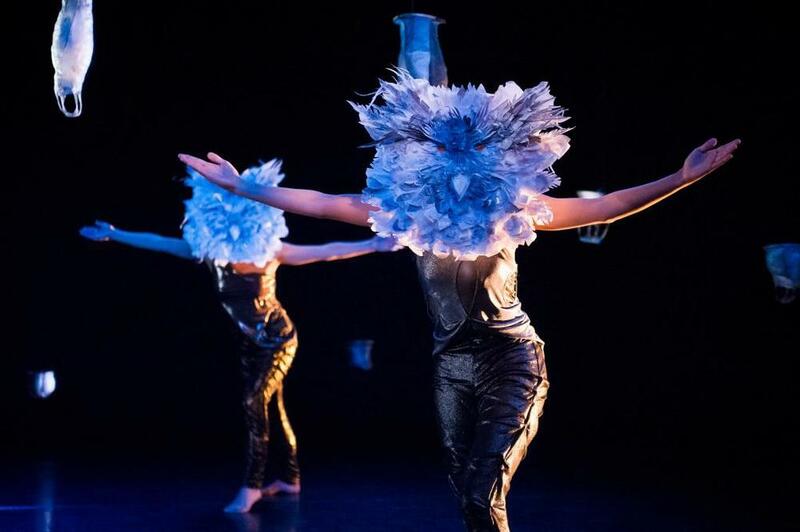 Camille LeFevre says the experience of Emily Johnson's latest dance work, NIICUGNI, is like being immersed in the waking dream of a young woman who, with ancestors and friends, navigates the terrain of memory and art-making. To my mind, something like Dreamtime is the experience Emily Johnson has created in her 90-minute performance-installation piece Niicugni. Co-presented by Northrop, the work had its regional premiere Sunday night at The O’Shaughnessy in St. Paul. Johnson isn’t Australian. She’s of Yup’ik descent, a Native American tribe in Alaska. And yet, while sitting in the hushed and darkened auditorium beneath an array of lanterns hand-sewn from fish skin, gazing at a dark stage illuminated with more lanterns—they reminded me of shed cocoons, sacks of pearlized bone or the carapaces of long-gone gods—Dreamtime is what came to mind. And never left. Niicugni is the second in a planned trilogy inspired by and infused with the history and culture of Johnson’s Yup’ik heritage. The first piece, The Thank-you Bar, was performed on the Northrop stage in 2010 to small groups of people. Based, in part, on her grandmother's home and bar called The Que-Ana Bar (quyana is the Yup'ik word for “thank you”), that piece investigated the igloo myth, naming, home and art-making through storytelling, movement, music, audience participation and objects recast with new meanings. 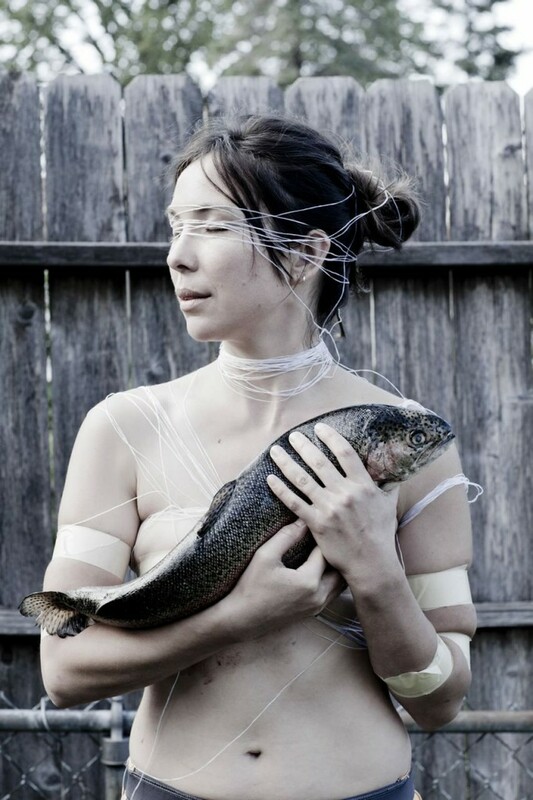 The third work, SHORE, will be part of a multi-day event with dance, storytelling and feasting premiering in June 2014. Johnson and Northrop just received a $30,000 MAP Fundgrant to support the work’s development, and a $155,000 Doris Duke Residency to Build Demand for the Arts grant supporting a Johnson-Northrop partnership to create greater demand for contemporary dance throughout the region, particularly in Native American communities. Niicugni, as in Dreamtime, combines streams of present, past and future through an ever-shifting, non-narrative, ebb and flow of movement, music, lighting, storytelling, facial expression, objects, and coming-and-going groups of people. And as in Dreamtime, in the present of Niicugni, Johnson has clearly and deeply tapped her childhood memories and cultural history. The constants in the midst of this flux are Johnson and the Vancouver-based Aretha Aoki, twin lithe bodies in shiny, ruched black leggings and glittery tops (costumes by Angie Vo) who emerge from the still dark, quietly flexing and scrutching themselves across the floor like salmon attempting to swim upstream. “A monster bit off my ear,” are the first words Johnson utters, each word rounded and polished and spaced deliberately apart from the next as if she were laying down, for time immemorial, a sequence of polished stones. “Niicugni” means “word” or “listen.” In her bookEskimo Essays: Yup’ik Lives and How We See Them, Ann Fienup-Riordan talks about how the Yup’ik value speaking out in the process of governance, and their need and desire to speak firmly. Malevolence, peril, abuse and violence pervade the early moments of piece as Johnson’s stories tell of bad men, worse governments, animals that are and aren’t her; she recounts the tale of how she got her cool blue eyes, a gift of the King Salmon. In the harrowing monster story, Johnson is at once a mighty tree, a singular voice and an entire community nearly cut and dug out of existence. Johnson and Aoki initiate a luscious series of movements that, we’re told, are no longer in the piece, but are being performed anyway to show what isn’t. Those dance phrases remain, like a kinetic afterimage in the mind’s eye and body’s memory -- of what was, may be or not -- but which, once conceived, remains a part of the piece nevertheless. The women become need made manifest and driven hard by animal instinct -- need and instinct transformed into breathtaking movement that forces the viewer to look at what they’re becoming. The tone modulates through a gamut of emotions and situations. There’s a story about a duck diving off a roof, crashing and asking Johnson for its feathers back (she’d pocketed them for Aoki’s hat). Johnson and Aoki giggle over memories of eating the dessert Baked Alaska.They hold up sheaves of paper on which their faces are projected. They wear owl masks. They speak of resolving to become warriors. Aoki recalls the time she turned into a bear. Johnson staggers under the weight of an invisible burden held in her outstretched in her arms—a gesture that recalls a memory of The Thank-You Bar. In a fierce duet, the women become need made manifest and driven hard by animal instinct -- need and instinct transformed into breathtaking movement that forces the viewer to look at what they’re becoming. The dancers stop, literally sucking air, like beached fish. Their faces contort through laughter, rage and grief until they become monsters themselves. Johnson and Aoki embody the continuum of memory, ancestry, ritual, being, nonbeing, existence, nonexistence, movement, and story anchoring Niicugni. Woven into that continuum are people who come and go; representing encounters, events, occurrences that happen in the every day, adding to the discursive storytelling and remembrance like rocks poking up in the fast-flowing stream. Dancers (Megan Meyer, Sally Rousse, Penelope Freeh), Heidi Eckwall (also the lighting designer), a group of older women, James Everest (carrying a furry box), Lynn Bechtold (playing a violin), and the fish-skin lantern sewers arise from their seats in the audience and walk up on stage. They strike a pose, complete a gesture, open their arms in grand port de bras, take a step, or run from one side to another. Then they walk off again. In Niicugni, Johnson’s dream is that of young woman who, with her friends and her ancestors, navigates the terrain of memory and art making. Imagine your childhood, the fullness of each day, the eternity of a week or a month, the enormous and unquestioned sense of connection with the natural world and the beings populating everyday life. Welcome to the all-at-once. Listen. And live.